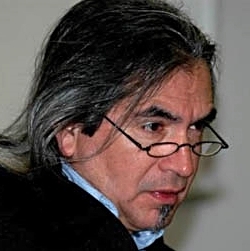 Daniel Wildcat, Ph.D., is a professor at Haskell Indian Nations University in Lawrence, Kansas, and an accomplished scholar who writes on Indigenous knowledge, technology, environment, and education. He is also director of the Haskell Environmental Research Studies Center, which he founded with colleagues from the Center for Hazardous Substance Research at Kansas State University. Wildcat helped design a four-part video series entitled All Things Are Connected: The Circle of Life (1997), which dealt with the land, air, water, biological, and policy issues facing Native nations. A Yuchi member of the Muscogee Nation of Oklahoma, Wildcat recently formed the American Indian and Alaska Native Climate Change Working Group, a tribal-college-centered network of individuals and organizations working on climate change issues. In 2008, he helped organize the Planning for Seven Generations climate change conference sponsored by the National Center for Atmospheric Research. He is the author, most recently, of Red Alert! Saving the Planet with Indigenous Knowledge (2009).